Sketchbook Rotterdam 1985, originally uploaded by Brin d’Acier. I started taking a sketchbook with me when traveling. This one was done with aquarelle pencils and gesso from the window of a house we stayed at in Rotterdam. It was my teacher who had recommended adding gesso to my brush to tone down the colours of watercolour pencils. 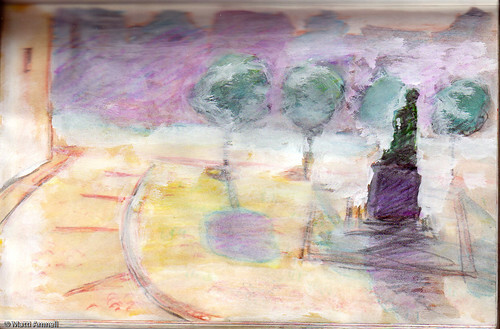 This entry was posted in Sketchbook, travel journal and tagged city, gouache, landscape, pencil, rotterdam, travel journal, watercolour. Bookmark the permalink.